The House of Savoy ( ) was formed in the early eleventh century in the historical Savoy region. Through gradual expansion, it grew from ruling a small county in that region to eventually rule the Kingdom of Italy until the end of World War II. Some argue, at the time that the title of king was abolished in 1946, the House of Savoy was the longest surviving royal house in the world. The House of Savoy emerged, along with the free communes of Switzerland, in what is now called Switzerland . The name derives from the historical region Savoy in what is now France . Over time the house expanded from that region to rule almost all of the Italian Peninsula. Yet their growth and survival over the centuries was not based on spectacular conquests, but on gradual territorial expansion through marriage and methodical and highly manipulative political acquisitions. The house descended from Humbert I, Count of Sabaudia (Umberto I "Biancamano"), (1003–1047 or 1048). Humbert's family are thought to have originated from near Magdeburg in Saxony , with the earliest recording of the family being two tenth century brothers, Amadeus and Humbert. Though originally a poor county, later heirs to the throne were diplomatically skilled, and gained control over strategic mountain passes in the Alps. Two of Humbert's sons were bishops at the Abbey of Saint Maurice on the River Rhone east of Lake Geneva , and Saint Maurice is still the patron of the House of Savoy. Humbert's son, Otto of Savoy ascended the throne in 1051 after the death of his elder brother Amedeo and married the Marchioness Adelaide of Turin, passing the Marquessate of Susa , with the towns of Turin and Pinerolo, into the House of Savoy's possession. This diplomatic skill caused the great powers such as France , England , and Spain to take the dukes' opinions into account. They once had claims on the modern canton of Vaud, where they occupied the Château of Chillon in Switzerland , but their access to it was cut by Geneva during the Protestant Reformation, after which it was conquered by Bern. Piedmont was later joined with Sabaudia, and the name evolved into "Savoy" (Italian "Savoia"). The people of Savoy were descended from the Celts and Romans. However, the years of the Renaissance in Europe witnessed the invasion and occupation of Piedmont by the French. When Charles VIII of France invaded Savoy, Piedmont, and Italy in 1494 and conquered Naples, the House of Savoy retreated and established its residence in Turin , where it remained until the unification of Italy. The crown of Sicily, the prestige of being kings at last, and the wealth of Palermo helped strengthen the House of Savoy further and they established themselves in the Kingdom of Sardinia. In 1792 Piedmont-Sardinia joined the First Coalition against the French First Republic, but was beaten in 1796 by Napoleon and forced to conclude the disadvantageous Treaty of Paris , giving the French army free passage through Piedmont. In 1798 Joubert, occupied Turin and forced Charles Emmanuel IV to abdicate and leave for the island of Sardinia. Eventually, in 1814 the kingdom was restored and enlarged with the addition of the former Republic of Genoa by the Congress of Vienna. In the meantime, nationalist figures such as Giuseppe Mazzini were influencing popular opinion. Mazzini believed that Italian unification could only be achieved through a popular uprising, but after the failure of the 1848 revolutions, the Italian nationalists began to look to the Kingdom of Sardinia and its prime minister Count Cavour as the leaders of the unification movement. 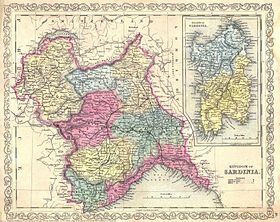 In 1848 under the Statuto Albertino Charles Albert conceded a constitution to the Kingdom of Sardinia including the parts of north-western Italy , such as Piedmont. The Statuto Albertino remained at the basis of the Kingdom's legal system even after Italian unification was achieved and the Kingdom of Sardinia became the Kingdom of Italy in 1861. Eventually, the King's decision had dire future consequences for Italy and for the monarchy itself. On October 28, 1922, Victor Emmanuel III selected Mussolini to become Italian Prime Minister, allowing Mussolini and the Fascist Party to pursue their political ambitions as long as they supported the monarchy. As Mussolini and the axis powers failed in the Second World War in 1943 Victor Emmanuel removed Mussolini from office and named Pietro Badoglio as his replacement. However, he made a blunder when he negotiated a surrender to the Allies without ordering the army to defend Rome. Left without orders, the army virtually disintegrated. Victor Emmanuel and his government fled south to Brindisi . Victor Emmanuel transferred most of his powers to his son, Crown Prince Umberto, in April 1944. Within a year, public opinion forced a plebiscite to decide between retaining the monarchy or becoming a republic. In hopes of influencing the vote, Victor Emmanuel formally abdicated on May 9, 1946. It did not work; 54% of the voters favored declaring a republic in the referendum held less than a month later. The Savoy family was required to leave the country. Taking refuge in Egypt, Victor Emmanuel died in Alexandria in 1947 and was buried there. The remaining members of the House of Savoy have been engulfed in controversy in the twenty-first century. On June 16, 2006 Vittorio Emanuele was arrested in Varenna and imprisoned in Potenza on charges of corruption and recruitment of prostitutes for clients of the Casinò di Campione (casino) of Campione d'Italia . After several days, Vittorio Emanuele was released and placed under house arrest instead. He was released from house arrest on July 20, but he had to stay inside the Italian borders. The English translation is: Victor Amadeus III, by the Grace of God, King of Sardinia, Cyprus, Jerusalem, Armenia, Duke of Savoy, Montferrat, Chablais, Aosta and Genevois, Prince of Piedmont and Oneglia , Marquis (of the Holy Roman Empire) in Italy, of Saluzzo , Susa , Ivrea , Ceva , Maro, Oristano , Sezana , Count of Maurienne , Nice , Tende , Asti , Alessandria , Goceano, Baron of Vaud and Faucigny , Lord of Vercelli , Pinerolo , Tarentaise, Lumellino, Val di Sesia , Prince and perpetual Vicar of the Holy Roman Empire in Italy. Victor Emmanuel II, by the Grace of God and the Will of the Nation, King of Italy, King of Sardinia, Cyprus, Jerusalem, Armenia, Duke of Savoy, count of Maurienne , Marquis (of the Holy Roman Empire) in Italy; prince of Piedmont, Carignano , Oneglia , Poirino , Trino ; Prince and Perpetual vicar of the Holy Roman Empire; prince of Carmagnola , Montmellian with Arbin and Francin, prince bailliff of the Duchy of Aosta , Prince of Chieri , Dronero , Crescentino , Riva di Chieri e Banna, Busca , Bene , Brà , Duke of Genoa, Monferrat, Aosta , Duke of Chablais, Genevois, Duke of Piacenza , Marquis of Saluzzo (Saluces), Ivrea , Susa , del Maro, Oristano , Cesana , Savona , Tarantasia, Borgomanero e Cureggio , Caselle , Rivoli , Pianezza , Govone , Salussola , Racconigi con Tegerone, Migliabruna e Motturone, Cavallermaggiore , Marene , Modane e Lanslebourg , Livorno Ferraris , Santhià Agliè , Centallo e Demonte , Desana , Ghemme , Vigone , Count of Barge , Villafranca , Ginevra , Nizza , Tenda , Romont , Asti , Alessandria , del Goceano, Novara , Tortona , Bobbio , Soissons , Sant'Antioco , Pollenzo , Roccabruna , Tricerro , Bairo , Ozegna , delle Apertole, Baron of Vaud e del Faucigni , Lord of Vercelli , Pinerolo , della Lomellina, della Valle Sesia , del marchesato di Ceva , Overlord of Monaco , Roccabruna and 11/12th of Menton , Noble patrician of Venice , patrician of Ferrara .